Imagine being able to make instant fund transfers from one e-wallet to another regardless of which bank or e-payment firm operates them. Or being able to shift what you have in any e-wallet to any bank account. The e-payment scene so far has been hampered because e-wallets can't deal with each other and don't have sufficient links with banks. But this will change with the opening up of Singapore's interbank instant fund transfer system, dubbed Fast, to non-banks such as GrabPay and Singtel Dash. 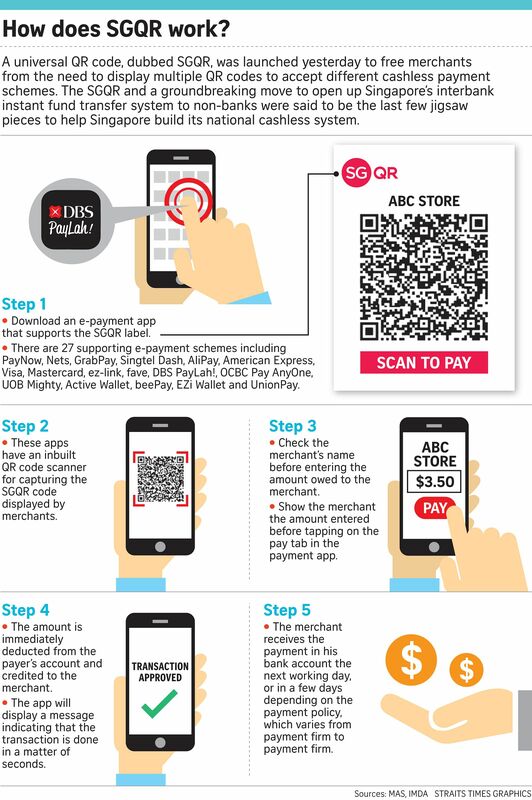 As the master connector to all e-wallets and payment apps for quick fund transfers, Fast is said to underpin the transformation of Singapore's cashless payment scene. Announcing this at the launch of Singapore's national QR code standard the SGQR yesterday, Monetary Authority of Singapore (MAS) board member Ong Ye Kung, who is also Education Minister, said: "If we want the e-payment system in Singapore to be truly open, accessible and competitive, we will have to open up Fast to other non-bank e-wallet payment solutions so that they can interoperate with bank accounts." In this way, an e-wallet can be topped up from any bank account, and its value cashed out into any bank account, Mr Ong said. If we want the e-payment system in Singapore to be truly open, accessible and competitive, we will have to open up Fast to other non-bank e-wallet payment solutions so that they can interoperate with bank accounts. EDUCATION MINISTER ONG YE KUNG, on transforming cashless payments. Money can also be transferred from one e-wallet to another as long as they are connected to Fast, and fintech companies can join the industry with lower barriers to entry, he added. Fast is the underlying network powering PayNow, which allows users to make fund transfers via people's mobile phone numbers or NRIC numbers without needing to enter any bank account numbers. Although first launched in 2014, Fast went mainstream only in July last year with the launch of PayNow. Since then, 1.2 million mobile numbers and 550,000 NRIC numbers have been linked to bank accounts, and about $1.5 billion has been transferred by PayNow. What Singapore is doing is not new. Britain and India have already allowed non-banks to access the central payment infrastructure, said Mr Ong. Meanwhile, fintech companies, including Britain-based TransferWise, ride-hailing app maker Grab and tech firm Razer have signed up to be part of a working group to iron out the technical requirements here. Singtel said it will join this group soon. For remittance services firm TransferWise, linking to Fast means it does not have to go through banks to reach the majority of e-wallet users here. "Currently, banks still play a significant role as the middleman in payments, and this adds to the cost and time needed to process the payments," said its head of banking Lukas May. Mr James Lloyd, consultancy firm EY's Asia-Pacific fintech leader, said that allowing fintech firms to connect to Fast will further drive the use of the platform. "Allowing fintech firms to connect to Fast will also encourage innovation in the financial services sector and widen customer choices. The key is to have a sufficiently wide and diverse selection of fintech firms," said Mr Lloyd. Mr Ong also said new guidelines will be launched later this month to protect consumers and small businesses from unauthorised transactions. For instance, banks will be liable for unauthorised transactions below $1,000 if a third party is at fault. For transactions above $1,000, banks will have to investigate and determine the liability of users on a case-by-case basis.